Porsche Club Racing’s Trophy East Series traveled to Daytona Beach, Florida for the 2018 season-finale. For the 11th consecutive year, Porsche Club of America’s Club Racing returned to the famed, 3.560-mile, 12-turn permanent road course at Daytona International Speedway. The weekend began with inclement weather, leading to an eventful first sprint. On the first lap of the TE6 15-lap race, pole winner Curt Swearingin (ACI Motorsports) and John Goetz (Hairy Dog Garage) went wheel-to-wheel into the third turn. As a result, the pair spun and were forced momentarily off of the track, as competitors raced past. Seth Davidow (Autometrics Motorsports), who started third, would win the first TE6 sprint. Jack McCarthy (Speedsport Tuning) and Richard Edge (ACI Motorsports) would finish second and third, respectively. In a field with 17 entrants, Gary Jensen (Pierce Racing Development), qualified fifth overall and finished the first sprint fourth, while winning the TE6 Masters class. The TE4CS class had even closer competition. Tom Collingwood (BGB Motorsports Group), qualified second and ended up getting past Efrin Castro (ACI Motorsports), the pole-sitter, for the victory. Castro and David Hurt (ACI Motorsports) would go on to finish second and third. John Crosby (NOLAsport) qualified first in the TE4CS Masters class, leading Charlie Craig (Autometrics Motorsports) by nearly 15-seconds. Craig who qualified 13th overall, finished second and his teammate, Stuart Briscoe finished third. By late-afternoon Saturday, weather and track conditions improved. As with all 2018 Trophy East races, the field of cars was set by the first sprint’s results. ACI Motorsports’ Swearingin finished first in the TE6 class. Davidow (Autometrics Motorsports) finished second and McCarthy (Speedsport Tuning) finished third. The pair finished just 0.314-seconds from one another. Pierce Racing Development’s, Gary Jensen, piloted his No. 11 TE6 Masters car to victory in class, for a second time at Daytona International Speedway. Collingwood (BGB Motorsports Group) would win the TE4CS class for his second time of the weekend as well. With ACI Motorsports’ Castro finishing second and Russell Walker with TOPP Racing finishing third. The TE4CS Masters class repeated their 1-2-3 finish: Crosby (NOLAsport), Craig and Briscoe (Autometrics Motorsports). The starting grid for the 2018 season’s final race was set by the fastest lap from the first and second sprint. For 80-minutes, all four Trophy East classes delivered the best season-finale the series has witnessed in its three years of existence. John Goetz (Hairy Dog Garage) would start first and lead the field of 17 into Daytona’s treacherous Turn 1. After nine laps of competition, ACI Motorsports’ Swearingin’s season was ended, after he experienced technical difficulties with the car. Hurt, Castro, and Collingwood would also not finish the season-finale. ACI Motorsports’ Richard Edge was disqualified following an accidental fuel spill during his pit stop. Goetz would ultimately win the session, from the pole-position. McCarthy and Davidow would finish second and third. Having not competed in either sprint races, Ken Finch (TOPP Racing) finished second, overall and first in the TE6 Masters class. NOLAsport’s John Crosby swept the weekend, repeating another 1-2-3 finish in the TE4CS Masters class. As for the TE4CS class, David and Russell Walker (TOPP Racing) finished first. NOLAsport’s Alejandro Galindo finished 0.814-seconds behind first, in second place. Bruce McKee and Sidney McKee, finished third, marking the second consecutive race where the father/son and father/daughter duos have podiumed together. At the conclusion of the event weekend, the Trophy East Series hosted their end-of-season banquet in the 500 Club at Daytona International Speedway. The guests were treated to stories from legendary racer Brian Redman, and the series’ organizers presented 2018 season awards to the competitors. The awards, not only marked the end of the 2018 season, it also marked the ‘changing of the guard.’ Current Club Racing Chair, Vicki Earnshaw, will step-down at the end of the year and the current series coordinator, Weston Dillard, will assume the chair position. The series presented three additional awards at the end of season awards banquet. The ‘Top Team’ award was presented to father/daughter combo Bruce and Sidney McKee; while, the father/son combo of David and Russell Walker took runner-up honors. The annual ‘Spirit-of-Excellence,’ award wen to series competitor, Tom Collingwood. 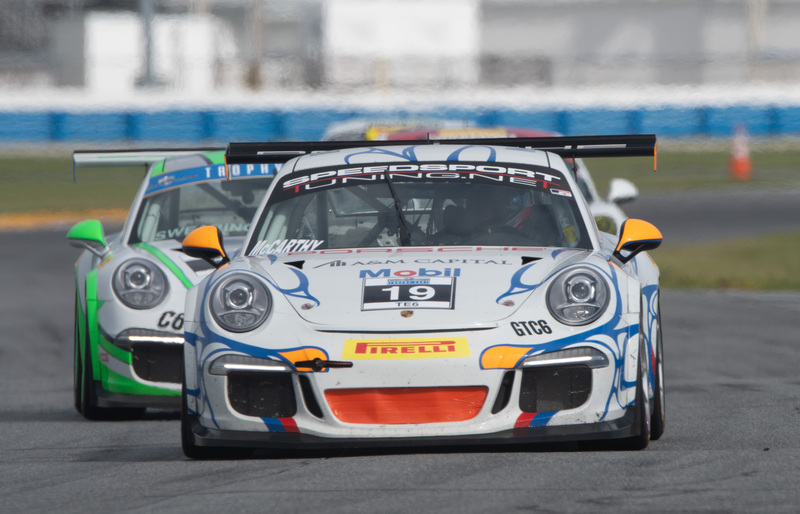 Collingwood consistently demonstrated a winning attitude and support for Porsche Club of America Club Racing and the Trophy East Series.